There are very few musicians who make their work seem easy. This comes off not because of simplicity in composition, but in how comfortable and confident the musician is in their own production. Not many exude this confidence as Rose Elinor Dougall does in her album Stellular. Dougall portrays her inspection into love and all its intricacies with strong vocals mixed with a carefully crafted production. Bring it all together and this album becomes something really special. Dougall starts the album with “Colour of Water,” a buildup introduces her strong and elegant voice moving effortlessly between words as a repetitive but effective synth heightens the opening. It’s an exciting start to an album that brings a lot of energy and celebration, which is more than enough to bring listeners wanting to hear what’s coming next. Easily the best song of the album. In “Stellular,” the lyrics range between themes of space analogies and the mysteriousness of character. These two themes merge together to create “You Are Stellular,” a line that encourages the listener to try and understand the mindset behind the phrase. The lyric in itself and Dougall’s delivery accentuates a pleasant depressed state. Add strong guitar chords assisting the synth base and the song is built as a balance between the calm voice of Dougall and a very strong production. One of the more sorrowful songs, “Answer Me” is where the synth production takes a side for a mostly piano and drum duet. “Answer me are we just killing time,” plunges right into the heart of a dangerous relationship where nothing is quite working out and what was once strong is no more. The song ends with a choir, echoing Dougall’s character as she awaits the answer. The piano and drum duet returns in “Poison Ivy,” but even they step aside for the power of Dougall’s vocals. She uses the verses to show off her range and elegance where every word is delicately sung. The song itself is not a particular favorite, but it’s Dougall’s performance that brings up the song from an average analogy to a display of skill and finesse. 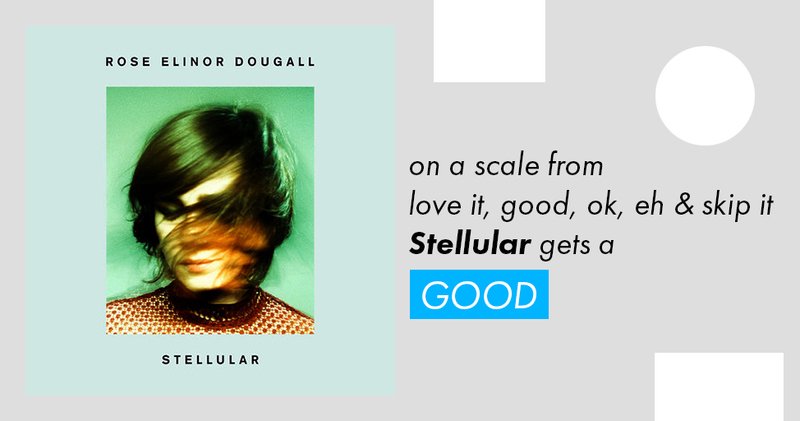 Stellular is just a thoroughly enjoyable album where Rose Elinor Dougall effortlessly journeys through all the layers of love with a production taking you right back to the 80s synth age. Though some only copy the 80s, Stellular is definitely a creation of her own. Excellent singing talent combines with a fun and varied music composition. It also helps that it sounds like Dougall is enjoying every minute of it. GOOD.